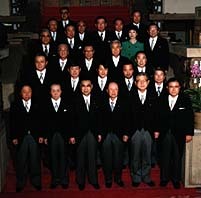 Keizo Obuchi (third from left, front row) and his cabinet; Masahiko Koumura, the new foreign minister, stands behind his right shoulder. On July 30 former Foreign Minister Keizo Obuchi named his choices for his new cabinet, after being elected Prime Minister in an extraordinary session of both houses of the National Diet. Obuchi, who was elected president of the Liberal Democratic Party on July 24, replaces Prime Minister Ryutaro Hashimoto, who resigned following the LDP's setback in the July 12 House of Councillors (Upper House) election. This LDP setback was reflected in the Diet's voting to install Obuchi as Prime Minister. He garnered a majority 268 votes in the 500-seat House of Representatives (Lower House), enough to gain him the nomination despite his loss in the Upper House to Naoto Kan, leader of the opposing Democratic Party of Japan. This marked the first time the Diet split in its vote for a Prime Minister since 1989. Obuchi immediately set about naming his cabinet, which he said would focus on reconstruction of the nation's limping economy. The key post of finance minister went to veteran politician and former Prime Minister Kiichi Miyazawa, whose economic expertise is highly valued by Obuchi. The new cabinet is also notable for its inclusion of a nonpolitician. Popular author and commentator Taichi Sakaiya, whose real name is Kotaro Ikeguchi, was tapped to head the Economic Planning Agency. A former bureaucrat with the Ministry of International Trade and Industry, Sakaiya left the government in 1978 to pursue a writing career. Named to the post of education minister was Akito Arima, who was elected to the Upper House for the first time in the election earlier this month. The former president of Tokyo University and chairman of the government's Central Council on Education is expected to take the initiative in educational reform. Also adding breadth to the cabinet is Seiko Noda, the posts and telecommunications minister. At 37, Noda is the youngest cabinet member in the postwar era, and is the only female to serve under Obuchi. She has experience as a parliamentary vice minister in the ministry she now heads. Twelve-term member of the House of Representatives; Chief Cabinet Secretary (State Minister); Foreign Minister; LDP President. Seven-term member of the House of Representatives; Director General, Environment Agency (State Minister); Parliamentary Vice-Minister for Finance. Six-term member of the House of Representatives; Director General, Economic Planning Agency (State Minister); State Secretary for Foreign Affairs. Two-term member of the House of Councillors and eleven-term member of the House of Representatives; International Trade and Industry Minister; Foreign Minister; Chief Cabinet Secretary (State Minister); Finance Minister; Prime Minister. First-term member of the House of Councillors; former President of Tokyo University. Seven-term member of the House of Representatives; Director General, Defense Agency (State Minister); Director General, Environment Agency (State Minister). Five-term member of the House of Representatives; Parliamentary Vice-Minister for Agriculture, Forestry, and Fisheries. Seven-term member of the House of Representatives; Education Minister; Deputy Chief Cabinet Secretary. Five-term member of the House of Representatives; Parliamentary Vice-Minister for Posts and Telecommunications. Two-term member of the House of Representatives; Parliamentary Vice-Minister for Posts and Telecommunications. Five-term member of the House of Representatives; Parliamentary Vice-Minister for International Trade and Industry. Eight-term member of the House of Representatives; Posts and Telecommunications Minister. Seven-term member of the House of Representatives; Parliamentary Vice-Minister for National Land; Director General, National Land Agency (State Minister). Six-term member of the House of Representatives; Minister of Home Affairs; Chairman of the National Public Safety Commission (Minister of State). Six-term member of the House of Representatives; Parliamentary Vice-Minister for Finance. Five-term member of the House of Councillors; Parliamentary Vice-Minister for Finance; Director General of the Hokkaido Development Agency and Okinawa Development Agency. Five-term member of the House of Representatives; Deputy Chief Cabinet Secretary. Author; Economic critic; Former bureaucrat, Ministry of International Trade and Industry. Three-term member of the House of Councillors; Parliamentary Vice-Minister for Science and Technology. Five-term member of the House of Representatives; Parliamentary Vice-Minister for Foreign Affairs.